I may of just found the perfect gift on sale no less for myself and all golf lovers out there and it has nothing to do with golf. 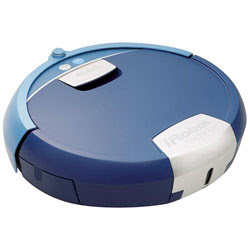 I was looking through Buy.com's weekly deals like I always do and I saw this blue round device that turned out to be an iRobot that will clean your floors. Yes I know it's crazy but this little contraption pictured below will clean your floors. Whether they're sealed hardwood, tile, or linoleum this floor washing robot will clean 4 average size rooms on one single charge. Now how do you figure this will help me and other golf lovers out there. Well with this floor washing robot at $149.99 a savings of $250 from it's listed price not only a great deal but your chores including floor washing will be cut to nil as your robot takes over the floor cleaning duties and you hit the links for more golf. It's a no brainer and one that I have no problem with paying the Buy.com price of $149.99. The iRobot 5999 Scooba Floor Washing Robotic Hard Surface Cleaner should be on ever golfers list this Fall so you can get out there and golf more while still getting your floors cleaned.